This is a fun and addictive little puzzle most commonly seen on a 3 x 3 grid. 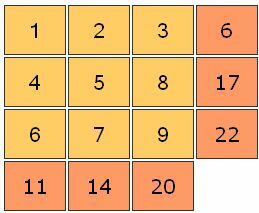 The aim of fubuki is simple - fill the grid with the given numbers in order to solve the puzzle and meet the constraints of the puzzle. The constraints are that the sum of the values in each row and column is stated at the start of the puzzle, and you must use your maths skills to work out where each number goes. There is only one valid combination and solution per puzzle, so you do not need to guess at any stage. Easier puzzles will tend to give you a few numbers as a head start. Puzzles also usually use the numbers 1 - 9 which appear once in the puzzle grid, but this does not have to be the case. If you are looking for a fun and popular maths based logic puzzle for publication and want something a little different, then you should look no further than fubuki! The fubuki puzzle can also be made interactively for use and play on a website, again if this is something you are interested in please just get in touch. For print publication and licensing, puzzles are supplied in print-ready PDF or EPS format (other formats available on request), and no order is too small or too large. In addition to the standard and most popular 3x3 puzzle we can also supply larger puzzles; note that they rapidly become more difficult and harder to solve due to the number of combinations involved, so do not think that like sudoku it would be a good idea to get a puzzle on a 9x9 grid, this would be almost impossible to solve without giving an awful lot of hints and clues as to the solution!